The AC-40 carries on the tradition of Roland’s acclaimed Acoustic Chorus series, delivering pure and natural sound amplification for acoustic guitars, vocal mics, and other acoustic instruments. Like the entire AC line, it features true stereo output with dual speakers plus built-in stereo chorus and reverb effects, providing studio-quality depth and dimension that’s not possible with mono amps. Ultra-compact and weighing under 12 pounds (5.3 kg), the AC-40 is a breeze to carry wherever you want to play. Though small in size, it has a big sound that easily carries your performance in venues such as intimate nightclubs, restaurants, and coffee houses. Thanks to the integrated tilt-back stand, it’s simple to angle the amp for more projection when placed on the floor or another flat surface. 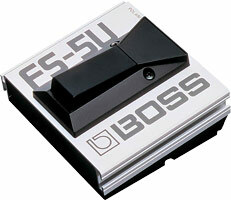 The AC-40 is also ideal as a personal monitor when performing on larger stages. With its two independent channels, the AC-40 gives you pro versatility for any performing setup. There’s a dedicated GUITAR channel with a standard 1/4-inch input, plus a MIC/LINE channel with an XLR/TRS combo input for connecting a microphone or a line-level device. Plug in a guitar and a mic for self-contained playing and singing, or use the channels to mix two types of pickups (or a pickup and a mic) in more sophisticated guitar rigs. Each channel has its own three-band EQ for sound shaping plus independent chorus and reverb controls, giving you complete command over your sound. As every live performer knows, acoustic feedback can sometimes be a problem on stage, especially in situations when you need to push the volume or when you’re playing in confined spaces. The AC-40’s anti-feedback function has got you covered, automatically suppressing feedback before it causes trouble. With the simple flip of a switch, you have the freedom to relax and concentrate on performing without worrying about unexpected sound hassles. The AC-40’s rear panel offers a number of connectivity options for a variety of situations. Connect an external music player to the stereo AUX IN for backing tracks and practice, and use the dedicated level control to balance the sound. Mono/stereo LINE OUT jacks give you the ability to connect to PA systems when performing in larger venues, or to recording devices to capture natural sound along with the amp’s rich stereo effects. Plugging into the PHONES jack mutes the internal speakers, letting you practice without disturbing others. 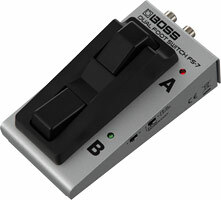 A jack is also provided for turning the reverb and chorus effects on/off with optional footswitches.